Hi, friends! Happy Thanksgiving to all my friends and readers in the States! Hope you all had a lovely holiday, and that you’ve found time to reflect on the things that you’re thankful for! I’m currently in my hometown, spending time with friends and family. I also spent some time in Michigan visiting my parents, and I was able to snap a few pics of my mom in her fancy dress! Sorry for the weird lighting-- you have about 20 minutes a day to take photos during winter in the midwest! 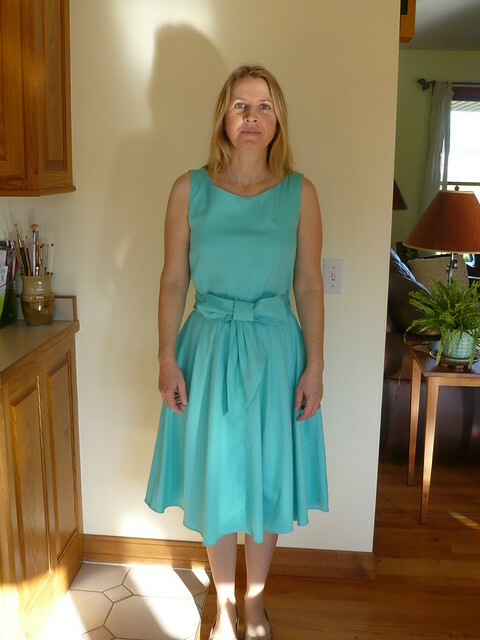 To refresh your memory, this is Simplicity 2444, and it’s made in a simple cotton sateen from Mood. 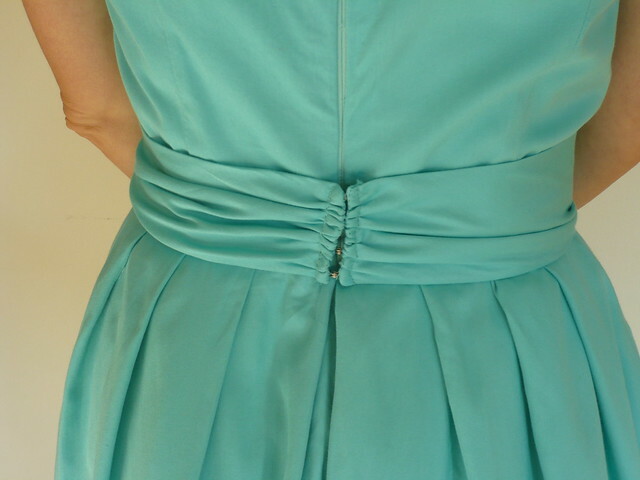 I stupidly forgot to take any photos of the inside of the dress, but it’s fully lined with bemberg rayon and all the seams are finished with Hug Snug (sooooo time-consuming, but it really looked nice). I spent a LOT of time on this dress, and I tried out tons of new techniques, so it was a real learning experience for me. It could have fit a little better, and I feel kind of gross and nitpicky when I look at the photos, but honestly, I think I did the best job possible with my limited experience and no way to check fit as I went along. Still, I wish it was a little more fitted, particularly in the neck/shoulders area. As far as the pattern goes, I definitely recommend it. I found the layout and instructions much clearer and nicer than Big 4 patterns usually are, and it’s very easy to mix and match the different style options (collar, sash, sleeve options, etc.). I did find the instructions for the pleats at the CF and CB confusing and unclear, but in the end, I just winged it and moved on. But it’s a nice style and it’s easy to imagine making multiple versions of this dress for different occasions. I really like the soft pleats in the skirt– they’re so pretty and flattering! Now, if you’re an eagle-eyed, observant, Sherlock Holmes-y sort, you may have noticed that the final dress is a bit different from both the line drawing and my earlier version. 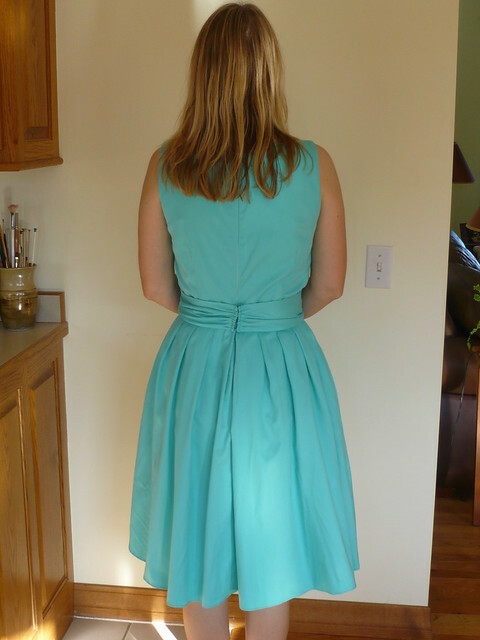 Mom didn’t like trying to tie the bow on herself, so she went to a family friend who is a master seamstress and asked her to tack the bow down to the front of the dress. It’s a little wrinkly, though, because it’s sort of hard to press now. Mom also didn’t like that the sash was set into the side seams, so Pat (our fearless seamstress friend) moved the sash all the way to the center back, gathered the ends, and secured them with hook-and-eyes. Look at my mom's freaky skinny leg!! OK, maybe that's just the shadows, but it still looks pretty funny. This photo pretty much tells you all you need to know about my mom– she’s goofy, girly, and doesn’t take herself too seriously. Plus, she’s cute as a button! Guys, I’m so glad these dresses are behind me! I’m getting a super late start on my Christmas gift making extravaganza, but I’m really looking forward to making some nice handmade gifts. Man Friend thinks I’m insane in the membrane for wanting to make gifts, but it really is something that I enjoy doing. But I’m going to go easy this year, make what I reasonably can, and avoid tantrums, tears, and all-nighters like the plague! How about you guys? Are you making holiday gifts? What else do you have on your agendas? Oh, and I’ve really enjoyed reading your “Sew Grateful” blog posts, and I just want to echo them and thank you guys for the support, encouragement, advice, and inspiration you’ve blessed me with this year! 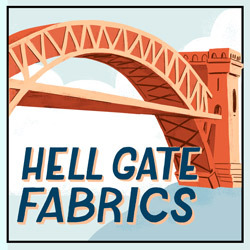 I don’t think I would still be sewing if it wasn’t for you guys, so THANK YOU! « There’s a New Lady in my Life! It’s so nice to finally see this dress, having followed your construction of it! It really turned out great, and I’m sure your mom was just tickled to have a dress hand made by you. And you’re right – she is cute as a button! You did an excellent job, your mum looks fab in that lovely dress! Fantastic color and your Mom looks great! Wow the dress looks lovely on your mum! Simple lines and the bow adds just the right amount of interest. Thanks, girl! You were SO helpful– again, a million thanks for the help with the lining! You’re a miracle worker! Your mom is so cute and that dress sure turned out lovely. Like you, I’m also insane in the membrane about Christmas present making. And like your man friend, Mr. Stitch sat me down last week and said: “you don’t have to make all the presents you know?” To which I replied” “But I like to, it’s one of my favourite Christmas activities!”. Have fun with it! I can’t wait to see what you end up making! I’ve already seen sooo many cute gift ideas– it’s hard to narrow them down and pick just a few! lovely momma! 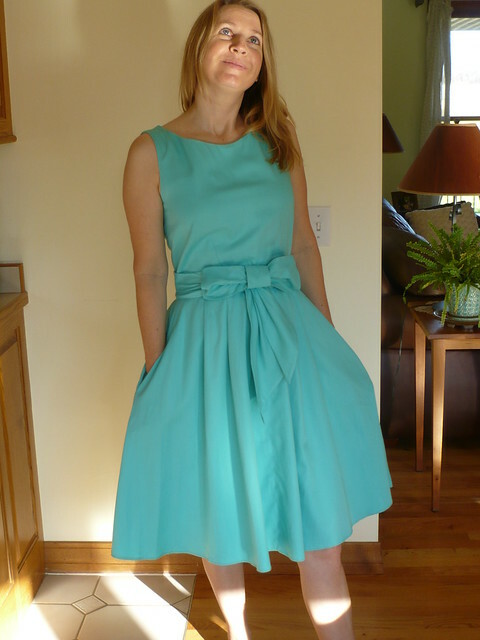 and, even more lovely that the tweaks she needed could be accomplished by another seamstress :))). the color is perfect on her! I know, right? Pat is the friggin’ best– she worked her magic on my wedding gown, and it was nothing short of amazing! We’re lucky to have such a talented friend! That dress is adorable, and so is your mom! I finished one Christmas gift and I’ll be working on the other one this week. The rest of the gifts I’m giving this year are being purchased, but two is pretty good! Are you making gifts this year? Also, what part of Michigan were you in? I live in Ann Arbor! We were in Sturgis, near Kalamazoo. My parents have lived there for three years, I think, and it’s a really nice place to visit. That’s great that you’ve already got a gift done! Good luck! I’m mostly going to knit gifts this year– it’s nice to have cozy things for the wintertime! What a stunning dress, it looks beautiful on you ! What a lucky mom…and a cutie too! 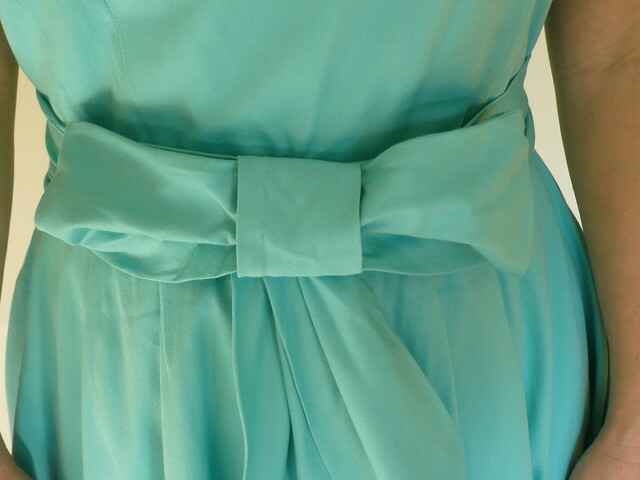 Love love the bow belt + color. More things in the world should be this color! BAH! I love this dress. I would have NEVER picked up this pattern, but the colour is sooo sweet and the bow? to die for. I need one. Thanks so much! It was so easy to put together! I bet you’d love making it!